Villa Barbara has a large private swimming pool and marvellous garden - a great choice for your Algarvean holiday! It's located in Carvoeiro, which was once a small fishing village. There are some shops and restaurants just 5 minutes' walk away, whilst the beach is with a few minutes' drive. A wider selection of facilities can be found in the resort centre itself. What's not to love? WiFi, pool heating and air conditioning/heating in the bedrooms are included in this 3 bedroom villa. The great outdoor space with a large private pool to chill out by. There are some restaurants and shops close by too! The large private swimming pool is surrounded by wonderful gardens with a great lawned area, rockeries, exotic plants and palms. There is plenty of space for sunbathing on one of the sun loungers - perhaps with a good book. For dining alfresco there is a table with chairs on the covered terrace and a brick BBQ to one side with a handy preparation area. There is also a convenient poolside shower. Through the entrance gates there is ample space for 2 hire cars. The front door opens into a hallway with the open plan lounge/dining room ahead. The open plan lounge/dining area has comfortable seating, a feature fireplace and flat screen TV to one side, and a dining table with benches to the other. Double patio doors allow plenty of natural light to flood in, as well as give access to the pool, gardens and attractive inner courtyard. The fully equipped kitchen is next door to the dining area and has a table with chairs where you can enjoy your morning coffee. There are 2 twin bedrooms sharing 1 separate shower room and 1 double bedroom with an en suite bathroom. All 3 bedrooms have patio doors opening onto the marvellous gardens and pool. There is also a separate WC. This villa is registered and licenced by the Portuguese Tourism Board and local council. This number is: 5799/AL. 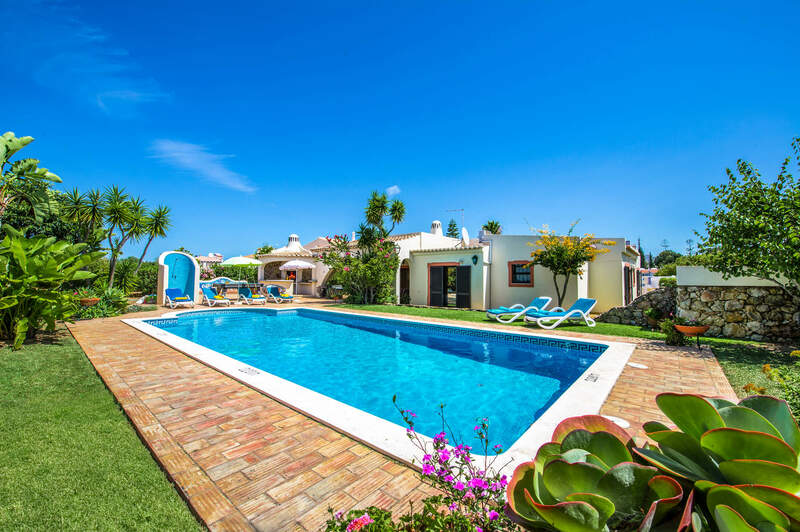 Close to the heart of Carvoeiro, Villa Barbara is in a great location with the resorts' golden sandy beach only 1 mile away. There is a choice of shops, bars and restaurants even closer within walking distance. The resort centre is a few minutes' drive away with a wider selection of amenities on offer. If you wish to get more out of your holiday this villa is conveniently located for those wanting to explore the neighbouring resorts. Within walking distance there are 2 mini markets and a coffee shop. A wider selection, including small boutiques and gift shops, can be found in the centre of Carvoeiro, a short drive away. The local municipal daily fruit, vegetable and fish market is held once every month in the neighbouring town of Lagoa. There are 2 restaurants a short walk away, whilst there is a wide variety of traditional and international restaurants and bars in the centre of Carvoeiro. Nearby Portimão, which faces Ferragudo on the other side of the Rio Arade estuary, is one of the Algarve's largest towns. There are traditional sardine restaurants to sample, an interesting old town, a splendid marina and a cinema. If you are looking for nightlife on your Algarve villa holiday, Praia da Rocha is a bustling resort just beyond Portimão. It has a huge beach and all kinds of bars, clubs and entertainment. Carvoeiro has its own sandy beach and Praia Grande can be found in the neighbouring town of Ferragudo. To the east of Carvoeiro is Armação de Pera, which also has a long sandy beach and promenade. Slide and Splash Waterslide Park is one of the most popular waterparks in the Algarve and is just a short drive away. Alternatively, Zoomarine is an exotic marine life theme park home to hundreds of fantastic and fascinating sea creatures. For American-style bowling visit Praia da Rocha Bowling Alley, located just off the seafront. The traditional old village of Pera is about 11 miles from the villa, with its church, typical narrow streets and small cottages - a taste of the real Algarve on the doorstep! Alternatively, the historic city of Silves, one of the Moorish capitals of the Algarve, is worth a visit with a cathedral, castle and museum. Lagos is about 30 minutes away by car - a charming historic town with a laid-back ambience and attractive marina. Gramacho is the closest golf course to the villa, which is just a couple of miles away. Alternatively, the very popular Salgados golf course is approximately 15 miles away, which is rated amongst the best in Portugal. Villa Barbara is not available to book for season as it is sold out. Take a look here at the Algarve villas that are currently on sale. The Former No1 player Nick Price has teamed up with the well known golf course architect Ronald Fream to create a uniquely designed 18 hole course with 27 varied greens. Golfers can play the same course several times with different greens and new challenges. The design technique has positioned the greens and protective bunkers so that an 18 hole round is a genuine challenge. The positioning of the tee markers helps to increase this variety still further. As in the case of the neighbouring Pinto Course this course is maintained at tournament standard all the year round. Although the course is designed in the style of Nick Price, the wonderful characteristics remain on the site from the boulder outcrops and dry stone walling to the fig, carob and olive trees. These have been complemented by artfully positioned lakes and bunkers. These hazards combined with the design of the greens and fairways result in a challenging but attractive course. At the end of the round experienced golfers will be able to confirm that they have played a great course. We loved the villa and hope to stay there again. The villa was lovely. The outside area was amazing and the pool table and table tennis table was a bonus! The pool was a nice temperature and over all we absolutely loved our stay in this villa. The only thing we wish we did differently was to hire a car as the big supermarkets where a long walk away but all in all we loved it. Definitely recommend! The Villa and the holiday were excellent. The washing machine was broken by what I assume to be the previous occupant. This was replaced by the owner by the end of the first week, so even this was quickly dealt with. Overall a super holiday. You know the quality when you book with Villa Plus - this is our 3rd villa and they have all been excellent.